"Readers of this work will learn that the Qur'an speaks to men and women with one voice, that men and women are equal when it comes to the worship of God. Thus, the male-dominated practices of several centuries derive not from divine revelation but from human error." - Charles E. Butterworth, University of Maryland"
An original and uncompromising study of the Qur'anic foundations of women's identity and agency, this book is a bold call to Muslim women and men to reread and reinterpret the Qur'an, Islam's most authoritative source, and to discover within its revelations an inherent affirmation of gender equality. Nimat Hafez Barazangi asserts that Muslim women have been generally excluded from equal agency, from full participation in Islamic society, and thus from full and equal Islamic identity, primarily because of patriarchal readings of the Qur'an and the entire range of early Qur'anic literature. Based on her pedagogical study of the sacred text, she argues that Islamic higher learning is a basic human right, that women have equal authority to participate in the interpretation of Islamic primary sources, and that women will realize their just role in society and their potential as human beings only when they are involved in the interpretation of the Qur'an. Consequently, a Muslim woman's relationship with God must not be dependent on her husband's or father's moral agency. Barazangi, an American Muslim of Syrian origin, is a scholar, an activist, and a concerned feminist. Her analysis of the complex interaction of gender, religion, and the power of knowledge for self-identity offers a paradigm shift in Islamic studies. 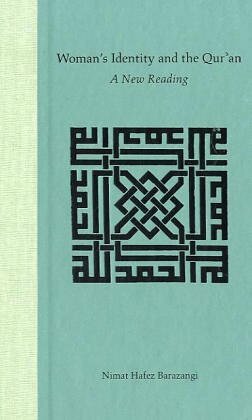 She documents the historical development of Islamic thought and describes how Muslim males have arrived at the prevailing exclusionary positions. She considers the issues of dependent morality and of modesty, especially in attire - a polarizing subject for many Muslim women - and she concludes that the majority of Muslim women today are not educated even for a complementary role in society. The book offers a curricular framework for self-learning that could prepare Muslim women for an active role in citizenship and policy making in a pluralistic society and may serve as a guideline for moving toward a ""gender revolution."" Her main thesis, if carried out in the lives of Muslims in America or elsewhere, would be so radical and liberating that her discourse is more powerful than those of many Muslim feminists. She writes, ""I intend this book to affirm the self-identity of the Muslim woman as an autonomous spiritual and intellectual human being.